Juniors Julian Dudzich, Amber Smale, and Abby Hunter ask for a moment of silence. Classes were stopped towards the end of third hour today when students participated in a nationwide walkout protesting gun violence following the Parkland shooting in Florida last month. 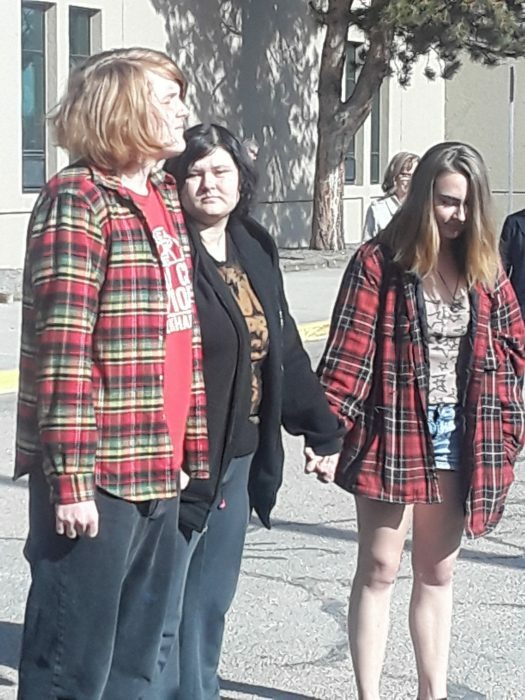 During the walkout, juniors Julian Dudzich, Amber Smale, and Abby Hunter stood in front of the large group that had gathered and called for a moment of silence to honor all the victims of school shootings. Junior Emma Anthony and sophomore Maria Juarez also expressed their pride in Arvada for standing up against such tragedies. “I want to be someone who fixes things. I don’t want to just be someone who sits there and watches someone else fix things,” said Anthony. School shootings are becoming a bigger issue in modern-day society. Many students are starting to question the safety of schools and many citizens are wanting to see changes on the government level that will ensure theirs, and their children’s, well-being. This isn’t the only walkout occurring this year. On April 20th, there is an opportunity for students to walk to City Hall Arvada to further protest gun violence in America. “I believe in a safer community for not just us, but for the future and I think that we have the power to change something now, so I think that we should,” said Anthony. Go to Jeffco Students for United Action Facebook Page for more details.